Can Seabiscuit’s DNA explain his elite racing ability? The US went crazy for Seabiscuit when he won his famous 1938 match race against War Admiral. Now researchers are investigating the thoroughbred's DNA to see what made him such an unlikely success. At the Institute for Equine Genomics here at Binghamton University, we try to better understand the genetic components associated with breeding success in thoroughbreds and other horse breeds. We are also interested in finding gene variants that could help horses before and after their racing careers. We’ve successfully run tests for horse farms across the U.S. and in South Africa and New Zealand to assist with breeding decisions and help them identify early which horses were probably not suited for the track. A few years back, Jacqueline Cooper from the Seabiscuit Heritage Foundation got in touch. She wanted to genetically test a fifth-generation descendant of Seabiscuit, named Bronze Sea, for breeding purposes. Jacqueline asked if any genetic information about Seabiscuit could be obtained from sequencing Bronze Sea. But since Seabiscuit was so far back in the pedigree, our lab really couldn’t be sure which of Bronze Sea’s genes came from his famous great-great-great grandsire. It would only work if comparison tissue from Seabiscuit still existed – an unlikely proposition since he died in 1947 and is buried in an undisclosed grave at Ridgewood Ranch in Northern California. During a group phone call between me, Jacqueline and Michael Howard, the great-grandson of Seabiscuit’s owner, he mentioned that Seabiscuit’s hooves had been removed and preserved after the champion died. Now this piqued my interest; my lab group has had great success extracting reasonably intact DNA from ancient bone samples. It turned out that Seabiscuit’s silvered hooves – think of a baby’s booties coated in metal – were on display at the California Thoroughbred Foundation. Although not common practice today, historically it was customary to remove the hooves of a champion racehorse as a keepsake prior to burial. The silvered hooves often served as decorative mementos, sometimes even being used to hold cigarettes and matches. This somewhat rare genetic combination of stamina and speed seems to be reflected in the champion’s race record, as he won races from as short as 5 furlongs (sprint) to as long as 1¼ miles (distance). Further, horses of today that we’ve identified with this genotype tend to be late bloomers, winning their first race almost three months later, on average, than horses with a genotype associated with precocity. Sounds like Seabiscuit’s race record: He didn’t become a true racing star until his 4-year-old racing season. Our lab will continue to examine Seabiscuit’s genome, focusing on genes linked to other physical attributes, as well as genes that control temperament traits such as aggression, curiosity and trainability. Perhaps Seabiscuit had variants in these behavioral genes that gave him the incredible desire to win despite his less-than-ideal physical attributes. 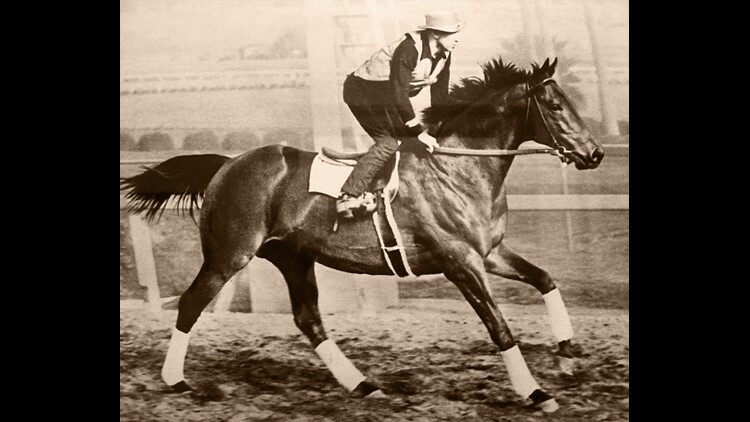 This article has been updated to correct the name of Seabiscuit’s descendant, Bronze Sea.